April 28th, begins the second week of the Counting of the Omer. This is the week of Gevurah. Gevurah is about the discipline of power and the power of discipline. A world filled with unconditional love cannot stand. It needs a little Gevurah to balance life and enhance the flow. This week we allow Gevurah to help us look into ourselves, illuminating the different corners that so often get overlooked in our workaday struggles. The unconditional love hidden within the disciplined path of power. Finding the strength to live a powerful life filling each moment with meaning. Discovering the balance that leans on inner power mitigating judgment with compassion. We strive to find the courage to act on our personal power. Exploring in quiet solitude the power and the process and the path that lies ahead. Settling our power deep within us. Letting go of the ego trappings of authority and discovering our true power and the power of truth. Gathering our gleanings of power and carrying them out into a world sometimes too short sighted to see and too deaf to the needs of humanity an our planet. We go forth to life, using our power not as stumbling blocks to the blind but as building blocks to blessing. The Counting of the Omer originated in a deep, loving relationship to the earth. For us, it has become process of re-creation, re-birth and re-newal of a sacred bond that grounds our hearts to the earth and lifts our souls to the heavens. The 49 day period is counted in days and weeks. The 7 days of each of the 7 weeks constitutes the 49 days. 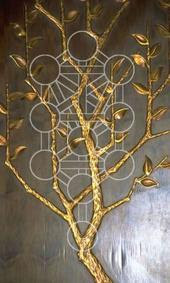 Each week is represented by a specific sacred attribute, called Sefirah from the mystical Tree of Life. Each day within that week is represented by an aspect of that attribute. We count the lower 7 Sefirot for the seven weeks. For each day, one Sefirah is counted within the Sefirah of the Week. The famous Kabbalist, the RaMaK, Reb Moshe Kordevero (ca. 18th cent) wrote a powerful work entitled PaRDeS. In it he explains the word Sefirah. He expounds that the word is related to the 3 mystical aspects of creation. MiSPaR, number, SiPuR, the story and Sapir the sapphire, the translucent crystal of illumination that is discussed in many works of Kabbalah. Each week, for the next 7 weeks I shall share with you the spiritual attribute, the Sefirah for the week, and the daily Sefirah SheBSefirah, the aspect within the attribute, according to Kabbalah. You might try an exercise, using these as meditation points in which you stand back and take an objective look at your subjective emotions (no small task in and of itself). Seeing their strong an weak points will, in turn, enable you to apply yourself to the development and perfection of these feelings as you grow towards emotional and spiritual maturity. The first week is Hesed. Hesed is unconditional love. It is compassion without bounds. It is the offering of love without the thought of recompense. Unconditional love offered freely even to those for whom we find difficulty offering love. Tough love, that teaches boundaries and consequences but measured with compassion and caring. Balanced compassion offered without judgment but with honesty and the frailness of fairness. Acts of loving-kindness is compassion in motion. True victory comes into the world through love activated in action. The love that sleeps quietly purring in my heart. It is the quiet cuddling, the comfortable silence of deep felt love. Soulful love that goes even deeper than the heart. Love that is core to our inner existence and our outer manifestation. It is the love that connects heaven and earth. Love given to the world around us is Malchut SheBHesed. Love that is felt must be fostered. For our planet to survive we must walk the path of love. For humanity to thrive we must live our love. Jews are crazy. These crazy people get together for a dinner party. It sounds nice, yes? They sit together and have a nice glass of wine, good. Then they eat some parsley. After that little bite of food they talk and they talk and they talk. They ask questions, they tell stories, they sing songs (what’s to sing about on an empty stomach) they might even act out a play. On and on it goes. Finally, when your stomach is growling, as you smell the food cooking, and your head is nodding from the second glass of wine, they announce the meal. They put some food in front of you. Don’t be fooled. First they give you a dry cracker. Then they put a large hunk of vegetable in front of you. Be warned! They call it a bitter herb. They aren’t kidding. It is bitter, tears pour from your eyes as they announce that you can eat a sandwich. Guess what! The sandwich is more of the cracker and more of that bitter herb. And just when your taste buds are on fire, a feast is served. The food is good and you relax. They even tell you how to relax. You have to lean on one side. Finally, when you have stuffed yourself, they announce dessert. Amazingly it is more of the cracker business. More wine more talk and finally you can go home. Jews are crazy. No, Jews aren’t crazy, we are tribal and we wish to tap into that mystical mystery of life. And what has been described is the Seder, from the point of view of someone closed to the mystery and who stands outside the tribal camp. For those who are willing to open their hearts and minds and souls, the Seder becomes a ‘soul transporter.’ It takes us back to a time of slavery and liberation. It challenges us to become aware of our tribal roots and our mystical branches. We ‘return to those exciting days of yesteryear’ when we first discovered that freedom is not free. We travel through ages to share moments filled with tyrants and torments, teachers and transcendental times. We taste fear and freedom in the Matzah that we eat. We re-turn, re-experience, re-view re-live and re-new that mystical moment when we burst the bonds of slavery and entered into holy service to our G, our world, to our fellow human beings and to our spiritual selves. Not a bad way to spend an evening really. Of all the Jewish holidays, Pesah is the one most commonly observed, even by otherwise non-observant Jews. Pesah begins on the 15th day of the Jewish month of Nisan. It is the first of the three major festivals with both historical and agricultural significance (the other two are Shavuot and Sukkot). Agriculturally, it represents the beginning of the harvest season in Israel, but little attention is paid to this aspect of the holiday. The primary observances of Pesah are related to the Exodus from Egypt after generations of slavery. This story is told in Exodus, Ch. 1-15. Many of the Pesah observances are instituted in Chs. 12-15. (the Time of Our Freedom). One of the most significant observance related to Pesah involves the removal of hametz from our homes. Traditionally this commemorates the fact that the Jews leaving Egypt were in a hurry, and did not have time to let their bread rise. Yet it also refers to the meal eaten on the first Pesah which was held before we left Eqypt. It also symbolizes the end of winter and eating the last of the winter stores. In a symbolic way, the of removing the Hametz is the challenge to remove the “puffiness” (arrogance, pride) from our souls. Hametz includes anything made from the five major grains (wheat, rye, barley, oats and spelt) that has not been completely cooked within 18 minutes after coming into contact with water. Orthodox Jews of Ashkenazi background also avoid rice, corn, peanuts, and legumes (beans) as if they were hametz. All of these items are commonly used to make bread, thus use of them was prohibited to avoid any confusion. Such additional items are referred to as “kitniyot.” In my family a great miracle happens just before Pesah every year. We become Sefardic and therefore kitniyot are found in our home. According to Halacha (The Jewish Path) we may not eat hametz during Pesah; we may not even own it or derive benefit from it. We may not even feed it to our pets or cattle. All hametz, including utensils used to cook hametz, must either be disposed of or sold to a non-Jew (they can be repurchased after the holiday). Pets’ diets must be changed for the holiday, or the pets must be sold to a non-Jew (like the food and utensils, the pets can be repurchased after the holiday ends). You can sell your hametz online at http://www.chabadcenter.org/ or through me (a form is included). From the gentile’s perspective, the purchase functions much like the buying and selling of futures on the stock market: even though he does not take physical possession of the goods, his temporary legal ownership of those goods is very real. It is a wonderful way to share this holiday with our neighbors. In years past I have sold my Hametz to ministers, priests, the chief of police, the mayor and other public officials. The process of cleaning the home of all hametz in preparation for Pesah is an enormous task. To do it according to Halacha, you must prepare for several weeks and spend several days scrubbing everything down, going over the edges of your stove and fridge with a toothpick and a Q-Tip, covering all surfaces that come in contact with foil or shelf-liner, etc., etc., etc. After the cleaning is completed, the morning before the Seder, a formal search of the house for hametz is undertaken, and any remaining hametz is burned. In my family it is the time for spring cleaning and, of course, to look through our stores and eat up all the Hametz the we can before Pesah, much weight is gained at this time. Matzah is unleavened bread, made simply from flour and water and cooked very quickly (under 18 minutes according to Halacha). This is the bread that the Jews made for their flight from Egypt. It is also the reminder of the harvest festival known as Hag HaMatzot. The day before Pesah is the Fast of the First Born a minor fast for all firstborn, commemorating the fact that the firstborn Jewish males in Egypt were not killed during the final plague. (prayer book). An overview of a traditional Seder is included below. Pesah lasts for seven days (eight days outside of Israel). The first and last days of the holiday (first two and last two outside of Israel) are ‘Hag’, days on which no work is permitted according to Halacha. Work is permitted on the intermediate days. These intermediate days on which work is permitted are referred to as Hol Ha-Mo’ed, as are the intermediate days of Pesah. A vegetable (usually parsley) is dipped in salt water and eaten. The vegetable symbolizes springtime; the salt water symbolizes the tears shed as a result of our slavery. Parsley is a good vegetable to use for this purpose, because when you shake off the salt water, it looks like tears. The middle of the three matzahs on the table is broken. Part is returned, the other part is set aside for the afikoman (see below). The Motzi blessing, a generic blessing for bread used as a meal, is recited over the matzah. A blessing is recited over a bitter vegetable (usually raw horseradish; sometimes romaine lettuce), and it is eaten. This symbolizes the bitterness of slavery. (Note that there are two bitter herbs on the Seder plate: one labeled Maror and one labeled Hazeret. The one labeled Maror should be used for Maror and the one labeled Hazeret may be used in the Korech). Rabbi Hillel was of the opinion that the Maror should be eaten together with matzah and the paschal offering in a sandwich. In his honor, we eat some Maror on a piece of matzah, with some Haroset, a mixture of apples, nuts, cinnamon and wine, which symbolizes the mortar used by the Jews in building during their slavery. The Hillel sandwich originally contained lamb instead of Haroset. But since the destruction of the 2nd Temple we do not sacrifice animals, so there is no paschal offering to eat (though that must have been a great sandwich). A festive meal is eaten. There is no particular requirement regarding what to eat at this meal (except, of course, that hametz cannot be eaten). Among Ashkenazic Jews, gefilte fish and matzah ball soup are traditionally eaten at the beginning of the meal. Roast chicken or turkey are common as a main course, as is beef brisket. The piece of matzah set aside earlier is eaten as “ the desert dessert,” the last food of the meal. Different families have different traditions relating to the afikoman. Some have the children hide it, while the parents have to either find it or ransom it back. Others have the parents hide it. The idea is to keep the children awake and attentive throughout the pre-meal proceedings, waiting for this part. The third cup of wine is poured, and Birkat Ha-Mazon (grace after meals) is recited. This is similar to the grace that would be said on any Shabbat. At the end, a blessing is said over the third cup and it is drunk. The fourth cup is poured, including a cup set aside for the prophet Elijah, who is supposed to herald the Mashiah. Our hope every Pesah is that the time of Mashiah (or the Messianic age for the modernists) will come about during this time. The door is opened for a while at this point for Elijah. On a historical note, Jews were accused of heinous crimes such as putting the blood of Christian babies into the matzah. In fear of oppression and false accusations we opened the door to show our Christian neighbors that we were innocent of their blood libel. A curse against our accusers accompanied the opening of the door. But today we open the door and offer welcome to all who are hungry and in need, turning a custom that was a response to fear and prejudice into a sacred moment of openness and tzedaka). A simple statement that the seder has been completed, with a wish that next year, we may celebrate Pesah in Jerusalem (i.e., that the Messiah will come within the next year). This is followed by various hymns and stories. May your Pesah be filling and fulfilling this year. May we, Members of the Tribe and Friends of the Tribe and even enemies of the Tribe, learn and grow and aim for a world filled with Peace. Outside of the High HolyDays Pesah must be the most widely celebrated Jewish holiday in America. I think that it has something to do with the pageantry, the rituals, food, the fun and, of course, the learning. Pesah is a learning holiday. Every aspect of the holiday teaches us a lesson. The Seder is a series of teaching devices to explain the story of Pesah to Jews of all ages. Indeed the word for the book that we use at the Seder, Haggadah, comes from the word, L’Haggid which means to tell. But the Seder is not the only teaching device in Pesah. There are many others. For example, Hametz. Hametz is leavening and, we are supposed to avoid it on Pesah. The rituals surrounding the ridding of our homes of Hametz can be used as a string of educational toys for us and our neighbors. There are three rituals that have to do with the ridding of our homes (and maybe our hearts) of Hametz. They are; 1) M’hirat Hametz, 2) B’dihat Hametz and 3) Bi’yur Hametz. Let’s take a look at these rituals and how they can be used by us as a “string around the finger” a reminder of the higher self that is in each one of us. 1) M’hirat Hametz means the sale of Hametz. Before the beginning of Pesah, we do a spring cleaning. After the cleaning process, we make a ritual sale of whatever Hametz is left. Here is how it works. We put all of our cereals and grains etc. in a closet and tape the doors shut. Then we ritually “sell” the Hametz to those for whom there is no injunction against Hametz. Next comes 2) B’dikat Hametz, the search for Hametz. The night before Pesah, we make a ritual search for the last crumbs of Hametz in the house. Traditionally, this is done with a feather, a wooden spoon, and a candle if you are Ashkenazi. Sefardim use a knife and a candle. Lastly, comes 3) Bi’yur Hametz. The morning before the first Seder the Hametz that has been collected is burned with appropriate prayers. Now we are ritually ready for Pesah. But what can these rituals teach us? What is the “right” that go along with these rites. How can we use these rituals to make ourselves better people, to open our eyes to our inner selves? Let’s take a look at them again. 1) M’hirat Hamatz, the sale of Hametz is a public statement. It is a way of sharing with our neighbors who we are and the righteousness for which we strive. Let’s try it, let’s go to our non-Jewish neighbors and discuss the meaning of Pesah. Let us begin the process of sharing our different customs as well as our similar ideals. Our neighbors will learn about us and, indeed, we may learn about them as well. It is a fun way of building bridges. We aren’t looking to end differences, just begin to understand and accept them. 2) B’dihat Hametz, let us search our hearts for Hametz, for that which is not fit for the celebration of Pesah. Let us examine our own prejudices, whether they be based on the differences of religion, race or origin. Have we been guilty of treating the stranger differently than the home born? Have we judged others on the basis of their looks or heritage? If so, (and who of us hasn’t) then it is time for the next step. 3) Bi’yur Hametz is the burning of the Hametz. Let us begin the process of purging not only our homes but our hearts of Hametz, the Hametz of hatred and racism. For isn’t that the true meaning of Pesah? Aren’t we commanded to remember that we were slaves in Egypt in order not to enslave others? Aren’t we required to remember that we were “strangers in a strange land” in order that we would treat others better than we have treated so often in so many lands? The lessons of Pesah are not so far away from our daily lives. But sometimes we need a little reminder or two or three. This week’s Torah Portion is called Aharei Mot. The words mean “After death!” One does not have to read the portion to be struck by the question. It is a question asked out loud or in the deepest recesses of our hearts. Is there anything after death? What is the trail of the soul when the garment that we call body has been returned to replenish the earth? The Jewish path speaks of 5 levels of soul. Each is a pointer towards a different way of looking at life and our soul connection to G, to each other, to the earth and to ourselves. Together they offer us a way to explore our own feelings regarding the infinite that is hidden just below the surface of our finite lives. NeFeSh is the physical soul that returns to the earth with the body. It becomes one with the spirit of the earth as our body becomes one with the matter of the earth. Some might refer to this as becoming one with the ‘Gaia spirit’. The next level is RUaH, the wind spirit aspect of our soul. My father (zt’l) would speak of anonymous immortality. Imagine that you share some important life lesson with a friend. That friend is moved by your teaching. S/he shares it with others in your name. They share it with others and so on. But during the passing of the teaching, your name disappears from the story. The story lives on and in this way you live on in the realm of RUaH but your name does not; anonymous immortality. The stories and lessons that we share regarding our parents, our teachers, our ancestors keep their RUaH, their wind spirit alive in our realm. This is why tribal folk keep an oral history. The tribe lives on in the oral history and in the actions based on that history. When I tell stories of my parents and grandparents, or when we tell the stories of Sarah and Avraham, Moshe and Miriam, Ester and Mordecai, their RUaH feeds us, feeds the tribal RUaH. The third level is NeShaMaH, which is the breath of our soul. I envision a tiny, invisible silver thread connection to the Wholly One of Being. Since all humans have this connection, the picture is of a spider web of inter-connection between us all and with G. Our joys and sorrows strengthen the web connection of NeShaMaH. Each of us from the greatest Tzadik (righteous one) to the most mean spirited Rasha (evil one) is part of the web. On our computers we see WWW/World Wide Web but that is a pale shadow of the greater WWW that connects us to the Wholly One of Being. Ignore it if we will, it is always there. I remember a story of a Bar/t Mitzvah who said: “I don’t believe in G!” The Rabbi’s response was: “Don’t worry about it. G believes in you!” The World Wide Wholly One of Being Web (WWWOBW) is always connected and no virus can create a disconnect. The fourth level is HaYah, which can be translated as life and sometimes as a hungry wild beast. But here it refers to longing. We may long for more money, more stature but this is a deeper form of longing. This is a longing to elevate ourselves into a oneness with the Wholly One of Being. “Oh G, how I long to be with you, to feel you in my life!” HaYah is the holy longing. “Oh G, I am hungry for your presence!” In prayer we are in Hayah. We are, as Rabbi Avraham Yehoshua Heschel might say, in longing to be part of that which is greater than the self. We are in preparation and in longing for the final level of soul, of soulfulness. That level is YeHIDaH. YeHIDaH refers to being in total oneness. In Hebrew there are 3 words having to do with ‘One’. There is YaHaD in which I am one with… My belovedest and I are one. We are one made of parts. Indeed everything that is of matter is one, made of parts. All matter can be broken down into smaller parts. The next level is EHaD as we find in the Shema. EHaD is one without parts, impossible to dissect into aspects. Maimonides speaks of G in this way. G has no parts, G cannot be separated, broken down into components. G is the Wholly one; G is the Wholly One of Being. And the third level of ‘one’ is YeHIDaH. Not only is it one without parts, it is one alone. There is nothing else. There is not even a ‘nothing else’. The image is of G before creation. YeHIDaH is the oneness without parts and without ‘the other’. My mind has trouble wrapping itself around the concept. And yet that part of our soul is us yet not us it is a part of the One Who has no parts. On this level of soul, we do not exist as other than G.
So what happens Aharei Mot, after the passing of our physical? According to this paradigm, our NeFeSh returns to Gaia spirit. Our RUaH lives on in the souls touched by us in our journeys in this realm. Our NeShaMaH is wound back to G; our HaYaH disappears completely. For there is no longer longing as we become YeHIDaH, enfolded into the total oneness of the Wholly One of Being. I sometimes capitalize the transliteration of the Hebrew letters and keep the vowels (which were added later to the language) in small letters. This accentuates the root of the word. You ask the tough questions. That is good but it is not easy. So let us begin with PaRDeS, the four levels of understanding. I do this because there is no one simple answer to any question other than: Does G exist. To that the answer is an unequivocal, resounding, full-faithed YES!!! But that is because G is unique. To all other questions there are parts and nuances and areas open for discussion and question. And so let me explain my interpretation of that amazing spiritual orchard, PaRDeS. P=Pshat is the simple contextual meaning of things. Rashi is considered the greatest Pshat commentator. And yet there is a yang to the yin of Pshat. That is what I call the Modern Critical Approach or MCA. MCA demands provable facts and using commonly accepted logic in approaching theories. But if we leave it there, Torah is relegated to the shelf of wonderful books of stories and tales and history and laws of an ancient people. It is the book of struggle and growth of a people who have miraculously survived intact in a world that would have quickly drowned this unique people in assimilation, slaughter or xenophobia. On the other side of our Yin Yang is the Pshat of tradition. Torah is exactly true, the word of G that cannot be changed. G handed it down to us and that is that. I have a secret for you. I do not know of a single person on the planet who acts on that belief. If you look through the Stone Humash or any other Orthodox copy or Torah, you will notice that they ‘translate’ certain things in a way inconsistent with the simple translation. They interpret as they translate. I do not mean this as a criticism. Quite the contrary, it is crucial to keeping Torah a living document. I only disagree when it comes to the belief that only one group can interpret Torah. This is a dangerous two-sided coin. If only one group is allowed to interpret it leads to tyranny. But the question arises how wide can our interpretation go and still be within the box of Judaism. I admit, my friend that I have my arbitrary answer to that but I am not totally satisfied with it. I am not satisfied with any one answer and this goes to the crux of your question and it has no definitive answer. So let us continue and see where this path will lead us. We are now ready to confront the next level of the Orchard. R=Remez. Remez means hint. I think that this is a key element. If you believe that G wrote Torah and handed it down to us, then G put Remez hints in Torah for us to examine and for us to use in our growth. Why did G create Hava from Adam’s rib, in Braeshit 2? The commentators tell us that it was to prove that woman should be close to the heart of man. That is a classical Remez. Not so classical is why is there 2 creation stories in Braeshit 1 and 2. There is a different order to creation. Traditionalists have their answer. My own is that it is a reminder that Torah is not meant to be a book of facts and figures and we should not be viewing it that way. Torah does not come to teach us science or math or history or literature. It is there for us to use in our struggle to come to our own truth. Again this concept is fraught with challenges. Some have used Torah to be a proof text for abhorrent purposes. There were Rabbis in the south, before the Civil War, who pointed to Torah to justify slavery. And yet, the misuse Torah does not negate its power. It is simply that power can be used for good or for evil. The next level in our sacred Orchard is D=Drash. Drash literally means to expound. To me this is the use of the tools. I use Pshat/MCA as my starting tool. Then I hold up my Remez tool as I gently, lovingly explore Torah more deeply. Sitting back with the ideas that flow from the process I discover my drash, my personal point of view. I try it on and live it and play with it in different situations, argue it with my friends and loved ones, all to discover the fit. With that long-winded introduction let me try answering your questions. ‘Objectively’ does Torah come from G.? My answer is yes but not as a Microsoft word document. G inspires and influences but does not direct and command. Therefore Torah comes from G but it is not the literal word of G. That would be my ‘objective’ answer. It does not lessen my faith in G or in the power and beauty and truth of Torah. It does give me permission to be involved in the translation, interpretation and understanding of Torah. You stated that you found “…probably more truth then from any one place or source…” and I commend you on that. No one place has the market cornered on truth. Never stop looking and exploring. Are there caveats to that statement too? Of course there are. People are always saying think outside the box. That is nonsense. No one thinks outside the box. It is just that some people have a bigger box. Fundamentalists of all stripes have a small box. That is good for them. It is a snug and comfortable fit. As long as they do not try to force others into their box all is good. The Amish are proud keepers of their tradition as are Orthodox Jews and Fundamentalist Muslims, Christians etc. My only problem with small boxes is when they are places from which bomb are thrown or laws are made for those not in that particular box. Others have larger boxes. They are a loose fit and comfortable for many types of people. We meet each other there with little or no discomfort. Disputation and discussion are encouraged and growth and diversity are fostered. And if they accept that within these larger boxes are going to be people who insist on building smaller boxes for their own comfort, all is well in the neighborhood. Lastly we have those who are always building bigger and bigger boxes. They are the inventors of things and thoughts. They are never satisfied with the size of their box. They expand their minds and our universe. And we get to go along for the ride. Their boxes are sometimes uncomfortable for some of us because they are too large, they seem to lack safety and security. Things explode in them when ideas and inventions go awry. And yet if they are open to different size boxes dwelling within their huge box, then we, who need somewhat smaller boxes, feel warm and comfortable. And we are even are willing to expand our own boxes within theirs. Yet we all think within the box. I do not for one moment believe that there are many gods. Nor for one moment do I consider the possibility that there is no god. Those ideas I have examined and discarded. They are outside box. You then asked about some of the rituals of Judaism. And I can only suggest that you learn the ‘Pshat/MCA’ understanding of them while finding your own ‘Drash’ meaning for yourself. Then if it sinks into your soul it becoming part of your Sod it will be yours forever. For me the Mikvah is a place to release my spiritual baggage. After a week of the grind, as it were, it is a joy to go and study with my Rebbe and join him in the Mikvah. I feel that the baggage that I have been carrying, drop away from me. Arguments, and disappointments lose their meaning. All the times that I ‘should on myself’ during the week are allowed to float away. I emerge purified, meaning I have let go, and I am more prepared for that Shabbos space without time. My approach allows and even demands my active involvement. In this way I am not attacked with the all or nothing view of the small boxed folk. For them if one thing is not exactly the way they believe then nothing is. That is fine for them, but not for me. In Jewish tradition we are taught that there are many meanings, many ways of looking at Torah. I believe that we all have a right to translate Torah into our lives. As an aside you make a wonderfully Maimonidean comment. “Now I know that there is a level of law in place for the common folk in order to maintain an order and common balance for everyone…” Maimonides said that many of the 613 are for the masses to keep the people in balance and on the right path, and we happy band of philosophers keep them as an example for them. (Please take that as a ‘tongue in cheeky’ type of comment). You next ask how does one carry his beliefs into the real world. That is a great question because it shows that you realize that you are in a safe space for living an Orthodox life. That is the small box in which you currently reside. If you wish to keep living in that kind of box, there are many communities around the world where you could live comfortably and completely as an Orthodox Jew. But if you wish to live in a bigger box then you have to put some effort into discovering what is your path in that bigger box. It involves study and practice and questions and the ability to look within and make some hard choices. Then you must review those choices and be able to admit that you were wrong about one right about the other and adjust. But the most important thing that I can tell you is that it is a path without point of conclusion. This path is truly the never-ending story.